Qigong and Tai Chi have been practiced for thousands of years with benefits for health and longevity. 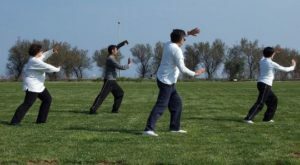 Qigong and Tai Chi training are designed to enhance function and regulate the activities of the body through regulated breathing, mindful concentration, and gentle movements. Only recently though have the effects of Qigong practice been scrutinized with empirical research. It has been found to be effective for an array of physical and psychological issues. It appears to strengthen the immune system, reduce inflammation, increase the number of cancer killing cells in the bloodstream and improve cardiovascular function. Because Qigong is not strenuous, involving slow gentle movements, and is safe, having no appreciable side effects, it is appropriate for all ages including the elderly and for individuals with illnesses that limit their activities or range of motion. So, with indications of so many benefits it makes sense to step back and review the research on the effects of Qigong training on health and well-being. In today’s Research News article “Beneficial Effects of Qigong Wuqinxi in the Improvement of Health Condition, Prevention, and Treatment of Chronic Diseases: Evidence from a Systematic Review.” (See summary below or view the full text of the study at: https://www.ncbi.nlm.nih.gov/pmc/articles/PMC6220394/ ), Guo and colleagues review and summarize the published research literature on the effects of Qigong practice on physical and psychological health. They found 28 published research studies. They report that the research finds that Qigong practice by healthy adults produces improvements in cognitive functions including concentration and attention, strengthens the immune system, improves body shape and size, physical function, and the cardiovascular system, improves mood and psychological well-being, improves lipid metabolism, slows physiological indicators of aging, and reduces inflammation. For clinical populations, they report that the research indicates that Qigong practice reduces depression, and improves osteoarthritis, including knee osteoarthritis, metabolic syndrome, and blood fat levels. Conclusions from these very exciting findings must be tempered as the research methodologies were often weak. More tightly controlled studies are needed. Regardless, these findings suggest that Qigong practice produces improved physical and psychological health in both healthy adults and people with mental and physical diseases. These are a remarkable set of benefits from this simple practice and suggest the reason why it has continued to be practiced by large numbers of people for hundreds of years. Hence, this simple, inexpensive, convenient, safe, and fun practice may improve the participants ability to successfully conduct their lives, improving health and well-being. So, improve health with Qigong. Qigong is a modality of traditional Chinese mind-body medicine that has been used to prevent and cure ailments, to improve health in China for thousands of years. Wuqinxi, a Chinese traditional Qigong that focuses on mind-body integration, is thought to be an effective exercise in promoting physical and mental wellbeing. Thus, we summarized the evidence and aim to unravel effects of Wuqinxi on health outcomes. We performed a systematic review of Wuqinxi studies published in English or Chinese since 1979. Relevant English and Chinese language electronic data bases were used for literature search. The selection of studies, data extraction, and validation were performed independently by two reviewers. A total of 28 eligible studies were included in this review, among which three are 3 in English and 25 in Chinese. The studies included in this review involve three different experimental designs: (1) 16 RCTs; (2) 2 historical cohort studies; and (3) 10 pretest and posttest studies (PPS). Participants in this review are categorized as either healthy or clinical populations. The results from this systematic review support the notion that Wuqinxi may be effective as an adjunctive rehabilitation method for improving psychological and physiological wellbeing among different age of healthy populations in addition to alleviating and treating diseases among various clinical populations. The results indicated that Wuqinxi has been thought to be beneficial to improve health and treat chronic diseases. However, the methodological problems in the majority of included studies make it difficult to draw firm conclusive statements. More methodologically rigorous designed large-scale RCTs with a long-term follow-up assessment should be further conducted to examine the effects of Wuqixi on health-related parameters and disease-specific measures in different health conditions. This systematic review lends insight for future studies on Wuqinxi and its potential application in preventive and rehabilitation medicine.